Epigenetics is the study of emergent properties in the origin of the phenotype in development and in modification of phenotypes in evolution. Features, characters, or developmental mechanisms/processes are epigenetic if they can only be understood in terms of interactions that arise above the level of the gene as a sequence of DNA. Methylation and imprinting of gene sequences are examples of epigenetics at the level of the structure and function of the gene, sometimes referred to as the phenotype of the gene, a concept that blurs (appropriately, we believe) the distinction between genotype and phenotype established over a hundred years ago. Inductive interactions between two cell populations that lead to the formation of a third are examples of epigenetic phenomena at the cell population level. Aspects of bone morphology are epigenetic in origin because they arise as the result of interactions between muscle activity and bone. The result of those interactions is not predictable from the intrinsic development of either tissue but can only be understood at the level of their interaction. Interactions between individuals of the same or different species also are epigenetic, as seen in adjustment of the number of soldiers in an ant colony in response to depletion of soldier numbers and to hormonal cues, or in the interactions between predator and prey species in the plankton where diffusible chemicals from the predator elicit the formation of features in the prey not seen in the absence of the predator. Epigenetics falls broadly within the area of systems biology premised on the concept that system-level phenomena are essential as explanatory factors in biology. Concepts such as epigenetics are required, not because biological systems are fundamentally indeterminate but because their complexity prohibits the construction of an exhaustive deterministic framework. Epigenetic explanations arise whenever we create theoretical constructs to make sense of the complex relationships between genetic and phenotypic variation and evolution. In these senses, canalization, developmental stability, and integration are epigenetic phenomena. Developmental pathways, networks and processes also are epigenetic concepts. Explanations of development and evolution that focus on properties of processes or pathways, such as the Atchley and Hall (1991) model for mandibular development or Salazar-Ciudad and Jernvall's (2005) interactome for tooth development are epigenetic explanations. In both those cases, the relevant parts of the explanations for phenotypic variation are at the level of the interactions among gene products, among cell populations, and among the processes generated that link the two levels. Biological systems may or may not be completely deterministic above the level of subatomic particles. However, they are functionally indeterminate in the sense that their complexity prevents us in most cases from creating frameworks that predict phenotypic outcomes directly from DNA sequences or sequence variation. Epigenetics is the study of the construction of frameworks that allow us to bridge the gulf between genotype and phenotype and thus integrate the vast amount of information that is being generated about the roles of specific genes in developmental systems. Thus, epigenetics is more than the study of emergent properties in developmental systems. It defines an area of study and a level of processes that creates a coherent understanding of the emergent (?) relationship between genotype and phenotype. The term epigenetics has increased in use in the molecular, evolutionary and developmental literature in recent years. Its varied use in evolutionary and developmental biology has made it meaningless to many. Our definition is very much in the spirit of Waddington's concept of the "epigenotype." We follow Hall (1990) or Salazar-Ciudad and Jernvall (2005) in defining epigenetics as the study of the epigenotype, which is the study of the properties of the pathways and processes that link the genotype and phenotype[bh1]. Molecular genetics, developmental biology and, to a lesser degree, evolutionary developmental biology have de-emphasized the study of epigenetics. This is due to technical advances that have greatly increased the pace at which gene-focused research compiles information about gene expression and uncover gene function, but also because of the prevailing notion that all explanations lie within the genome. We argue that while the pace of information accrual in developmental genetics has increased enormously, our understanding of the developmental basis for phenotypic variation has not. Integration of the concepts of epigenetics into research in mainstream developmental biology is essential if we are to answer fundamental questions about how development produces phenotypic traits such as skull shape or limb length and how it produces variation in those traits. Otherwise, we will continue to document correlations between variation in gene function and expression with phenotypic variation without a deeper understanding of how phenotypic variation is generated. . This volume explores the dimensions of epigenetics in different systems and contexts to show the central place and explanatory power of the concept for evolutionary and developmental biology. It seeks to rationalize and limit the meaning of the term epigenetics and its application so as to maintain and enhance its explanatory power and utility. The book is organized around themes and levels of interaction/processes in the biological hierarchy in which epigenetics acts. The first section lays out the conceptual foundations for an epigenetic view of development and the implications of that view for evolutionary biology. This section consists of two chapters. 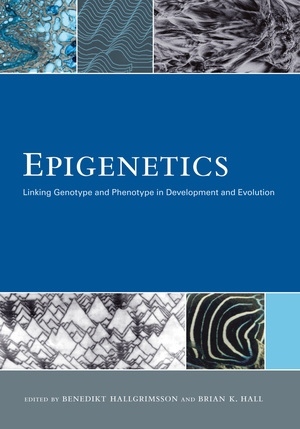 In the first, the co-editors of this volume pull together themes from the various chapters to present a coherent conceptualization of epigenetics that is true to the original intent of Waddington but also the usage of the term in modern biology. The argument made here is that Waddington's concept of epigenetics presaged a systems biology view of development and evolution and that much is lot to theoretical biology by throwing out this broader concept of epigenetics in favor of a narrower one focused only on chromatin modification. The third chapter by James Grisemer deals more specifically with how the discovery of epigenetic inheritance and epigenetic mechanisms have been incorporated into our understanding of the evolutionary process. Grisemer argues for a relative significance approach in weighing the role of these novel mechanisms against those based on genetic inheritance only. The second (may be third)section presents several different levels at which epigenetic concepts are applied to development and evolution. The first chapter in this section, by McEachern and Lloyd, deals with genomic imprinting, which is one of the key concepts in the modern study of epigenetics. The chapter explains this phenomenon, discusses its importance in plants, insects and mammals, and discusses its evolutionary significance. McEachern and Lloyd [bh2]make the case that molecular epigenetic processes are amazingly conserved across metazoan phyla. The next chapter, by Christoph Grunau provides an overview of methylation mapping in humans. In both chapters, the focus is on the phenotype of the gene and epigenetics is used in the sense in which it is used in molecular biology, referring to processes that influence heritable variation in gene expression without DNA sequence variation. The focus in both chapters is chromatin modification, in particular,methylation and acetylation. Chapter 6 by Gorelick, et al, presents what is, in some ways, a hybrid perspective between molecular biology and the older (classic?) Waddingtonian view. Gorelick et al. define epigenetic mechanism as those "…molecular signals that are literally on top of DNA…" (pg.X). Limiting the definition in this way, they retain a Waddingtonian view of the importance of mechanisms acting above the gene level and apply it to the evolution of asexual taxa. The next chapter, by Larsen and Atallah provides a contrasting and, we believe, complementary perspective on epigenetics, making the case for the need to consider emergent properties in development. Here, epigenetics is extended beyond the phenotype of the gene to include mechanisms and processes that can only be understood above the level of the gene. These include epigenetic inheritance, of course, but also emergent phenomena such as self-organization and variational properties of development (e.g., canalization, robustness). It also includes the spatiotemporal context of gene expression, and the interesting phenomenon of intergenomic interactions. Building on a similar perspective, the following chapter by Allessandro Minelli develops a theoretical framework for self-organization and inclusion of the physics of development into developmental and evolutionary theory. Minelli makes a case for defining null models in developmental biology and uses the phrase "developmental inertia" to describe the null conditions of developmental systems. Like Larsen and Atallah, this chapter draws extensively on well worked examples and nicely illustrates the use of Waddington's epigenetic concept in modern biological framework. These four chapters provide descriptions of very different conceptual approaches to epigenetics and examples and insight about epigenetic processes at very different levels of the epigenetic hierarchy. These chapters, which differ in perspective, are presented in the same section to make this contrast clear but alsoto draw connections between them. The next section is a series of case studies in which epigenetic processes at various scales are discussed in different organ systems. The first chapter, by Schurmans takes a molecular perspective on epigenetics and deals with the role of chromatin modification in neural development. The second chapter by Olsson deals with the next level of the epigenetic hierarchy, the self-organization of tissues. The specific topic is pigment patterns in vertebrates, a system that illustrates beautifully the potential for self-organization in complex developmental systems. The remaining chapters deal with epigenetic processes at the organ level or higher. The third chapter, by Alonso et al. discusses the role of epigenetic interactions in the cardiac neural crest and other tissues. Here, the concept is used in the Waddingtonian sense and the emphasis is on the emergent consequences of interactions between developmental components. The next chapter by Franz-Odendaal takes a similar perspective and applies it to the epigenetic processes that impinge on osteogenesis and chondrogenesis and the significance of these mechanisms for understanding the developmental basis for skeletal variation. The next chapter, by Sue Herring continues the skeletal theme at later developmental stages and a higher phenomenological level and deals with the epigenetic role of mechanical and particularly muscle bone interactions in skeletal development and the implications of these mechanisms for interpreting skeletal morphology in evolutionary contexts. The theme of mechanical interactions produced by muscle activity is then continued in the final chapter by Kablar, who deals with the role that this mechanisms plays in lung, retinal, and early skeletal development. The final section presents a series of chapters that apply epigenetic frameworks to the study of evolution and dysmorphology. The first chapter by Dan Lieberman makes the case for the evolutionary significance of epigenetic mechanisms as determinants of integrated and evolvable complex phenotypes. To make this point, Lieberman analyses the vertebrate skull and builds on a body of work in which he and others have demonstrated the existence and importance of epigenetic mechanisms in determining the patterns of variation in craniofacial shape. The second chapter in this section, develops this a similar argument but in a somewhat different direction. Zelditch and Swiderski emphasize the distinction between epigenetic mechanisms and genetic pleiotropy as determinants of integration. Using the mammalian dentary as their example, they summarize what is known about the developmental basis for integration in that system. They argue that epigenetic pleiotropy needs to be recognized as a distinct phenomenon, somewhat akin to developmental plasticity. This argument echoes those made by both Waddington (1957) and Schmalhausen (1949) who argued independently for the epigenetic basis for phenotypic plasticity. This theme is continued in the next chapter by Foster and Wurd, who address phenotypic plasticity in the threespine stickleback, arguing for an evolutionary role for genetic assimilation ( "Baldwin effect") in radiations of the threespine stickleback. For Waddington, genetic assimilation was one the main ways in which epigenetic mechanisms were relevant to evolutionary change. The discussion of genetic assimilation and phenotypic plasticity continues in a very different phylogenetic context in the chapter by Neufeld and Palmer who discuss the interaction of developmental plasticity in morphology and behaviour, as expressed as learning in particular, and the relationship of this interaction to rates of morphological evolution. They make the novel argument that learning-enhanced morphological plasticity plays an underappreciated role in morphological evolution. The next chapter, by Thomas Hansen, provides an interesting and challenging counterpoint to the previous four. He tackles the question of the adaptive significance of the epigenetic processes that underlie phenotypic variability from a quantitative genetic perspective. Hansen reiterates the often misunderstood point that selection does not always produce adaptation, and he examines critically the assumption that variational properties that result from such epigenetic interactions as integration, plasticity, canalization, and evolvability, are adaptive and thus driven by selection for their adaptive value rather than indirectly by selection acting on other aspects of the phenotype. He shows that variational properties may commonly arise as an indirect and secondary result of selection acting directly on the traits themselves, a finding that has profound implications for our understanding of the role of variational properties in evolution. Two chapters then discuss the role of epigenetic mechanisms in dysmorphology and disease. The first by Pervical and Richstmeier deals with craniofacial dysmorphology and involves mechanisms that, akin to those discussed by Lieberman or by Zelditch and Swiderski, involve interactions between developmental components that produce emergent properties. The second chapter in this pair and the final chapter of the volume takes a more molecular approach to the study of human disease. In this chapter, Gluckman et al. provide an overview of the epigenetics of human disease which, while limiting the definition of epigenetic mechanisms to chromatin modification, also draws upon many of the observations that informed the early discussion of epigenetic mechanisms. The motivation behind this volume is to pull together the divergent approaches through which the mechanisms that link the genotype and phenotype maps are explored. A thorough treatment of epigenetics, however defined, is well beyond the scope of a single volume such as this. What we have done, however, is to pull together scholars who are using the concept of epigenetics in a variety of contexts to show the common root of these approaches, mostly in the work of Waddington and Schmalhausen, and to show the connections that still exist between these approaches. It is likely that as the field of molecular epigenetics grows those who use epigenetics in the context of chromatin modification will be increasingly unaware of its roots in the developmental and evolutionary biology of the 1940s and 50s. It is also possible that systems biology will recreate much of the theoretical framework of higher-level epigenetics without reference to its conceptual roots. An important aim of this book is an appeal against both of those trends. It is clear from the work presented in this volume that in the minds of many scholars the concept of epigenetics in the broad sense envisioned by Waddington still has theoretical coherence in the face of the monumental complexity of modern biology. Indeed, only an epigenetic approach will allow us to unravel that complexity. We hope that the reader will agree. Illuminating the processes and patterns that link genotype to phenotype, epigenetics seeks to explain features, characters, and developmental mechanisms that can only be understood in terms of interactions that arise above the level of the gene. With chapters written by leading authorities, this volume offers a broad integrative survey of epigenetics. Approaching this complex subject from a variety of perspectives, it presents a broad, historically grounded view that demonstrates the utility of this approach for understanding complex biological systems in development, disease, and evolution. Chapters cover such topics as morphogenesis and organ formation, conceptual foundations, and cell differentiation, and together demonstrate that the integration of epigenetics into mainstream developmental biology is essential for answering fundamental questions about how phenotypic traits are produced. Benedikt Hallgrimsson, Professor in the Department of Cell Biology and Anatomy at the University of Calgary, is coeditor of Variation: A Central Concept in Biology and of Advanced Imaging in Biology and Medicine: Technology, Software Environments, Applications. Brian K. Hall is University Research Professor Emeritus at Dalhousie University. His latest book is Evolution: Principles and Processes.